Cuba is all the rage now. Since the U.S. Department of State announced a new course in relations with Cuba in December 2014, we’ve come a long way in getting people there. Traveling restrictions have been considerably relaxed – actually, traveling to Cuba has never been illegal, but spending money on the island was, and it’s hard to do one without the other. 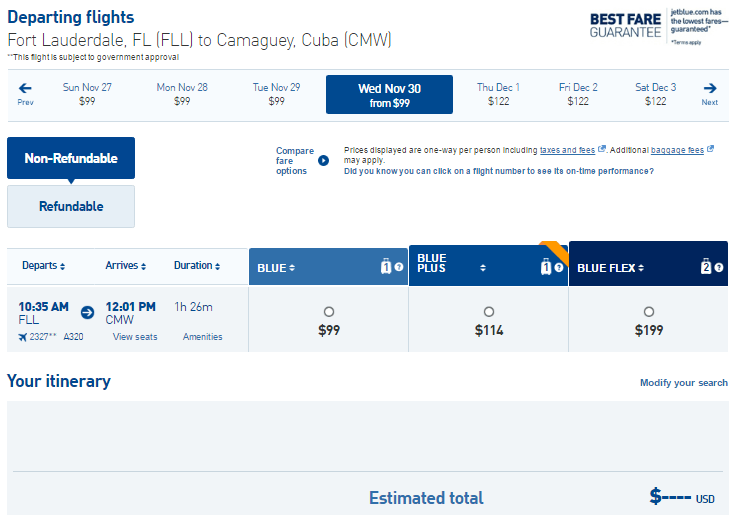 Technically speaking, it’s not like anyone can fly to Cuba just as you fly to any other place in the world, as you must cite one of 12 reasons so the airline could sell you the ticket. However, these 12 categories of “travel permitted transactions” approved by the Department of State, are so broad that it appears there might be something for everyone. Still, regular tourism, like a beach vacation, is not allowed yet, at least officially, although it’s not clear who and how would enforce these provisions. This NYT article explains in more details what permitted activities in Cuba are. There are currently eight U.S. airlines that have been approved by the Department of Transportation for regularly scheduled flights (as opposed to charter flights) to Cuba: Alaska, American, Delta, Frontier, JetBlue, Southwest, Spirit, Sun Country and United. With the flight that commenced on August 31 from Fort Lauderdale to Santa Clara, JetBlue became the first U.S. airline to resume commercial scheduled flights after the 50-year hiatus. The airline is starting with three destinations: Santa Clara, Holguín and Camagüey and is cleared for up to seven flights daily. 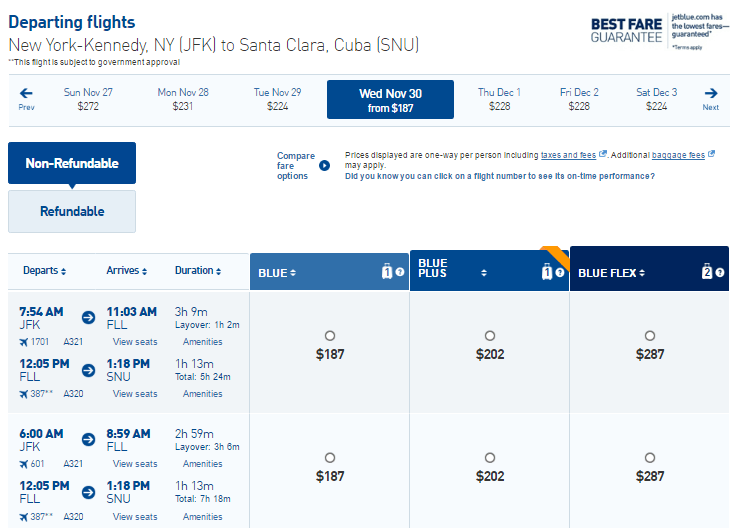 But what’s more interesting is the JetBlue airfares are very reasonable when you are booking in advance, especially compared to charter flights that can cost hundreds of dollars. 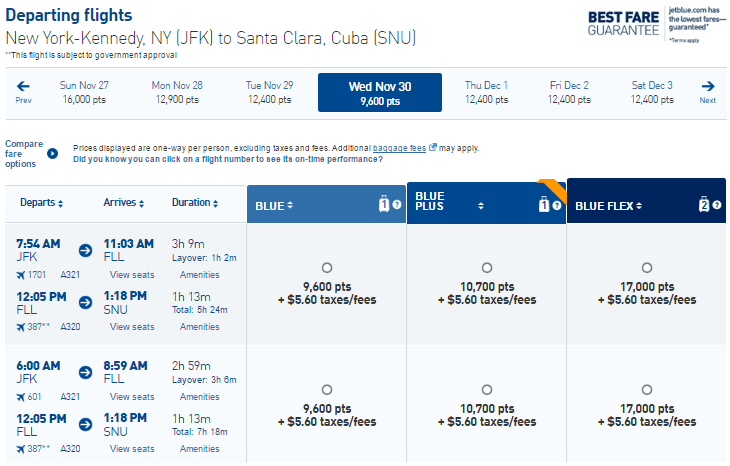 The most amazing thing about JetBlue’s Cuba flights is how cheap they are on points. Since JetBlue is a revenue-based program, its levels closely correlate to the cash cost of a ticket, and in most cases you are lucky to get a value of 1.6-1.8 cents per point. 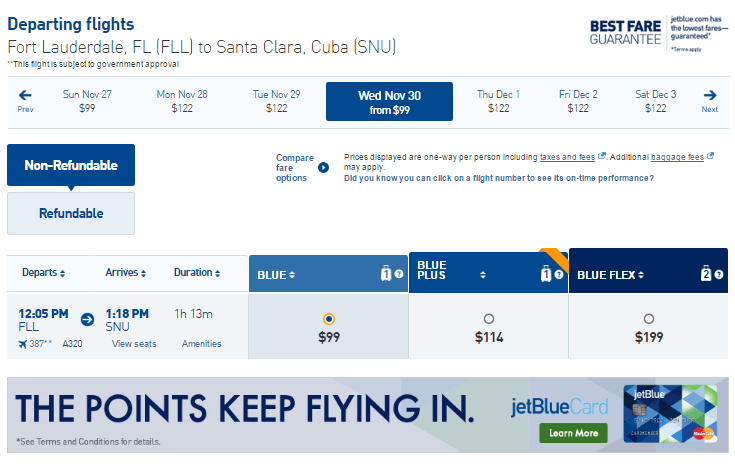 Not so with JetBlue’s Cuba flights. If we deduct $5.60 from the cost of the ticket, we’ll find out that 3,500 points can buy us $93.40 in travel – a stunning 2.7 cents per point ratio! And for Holguin, which is the third. Unfortunately, this bargain is somewhat limited for the nonstop flights originating from Fort Lauderdale. If we try a connecting flight from New York, we’ll get a 1.9 cents per point ratio, which is respectable, but not nearly as good. Are These Cities Worth Visiting? Camagüey appears to be the most interesting of the three JetBlue destinations. Camagüey’s historic center is a beautifully preserved UNESCO World Heritage site filled with extravagant churches, colorful colonial buildings, cobblestone streets and beautiful plazas. Located in the center of the island, it’s just a short trip away from the stunning Santa Lucia beach in the North and archipelago Jardines de la Reina in the South, which is the home of a huge and unspoiled marine reserve. Santa Clara lies in a relatively close proximity to Havana (about 4.5 hours by train or bus), but most people who fly to its international airport go there for another reason – to the all-inclusive resorts of Cayo Santa Maria, which are famed for its pristine beaches with exceptionally fine white sand. Cayo Santa Maria is the busiest resort destination in Cuba after Varadero. Holguín’s main appeal is also the beaches, which, while not as famous as Varadero or Cayo Santa Maria, still attract a number of tourists from Canada, Germany, Great Britain and other sun-deprived nations due to its fine sand, unspoiled beauty and, an occasion, bargain at its all-inclusive resorts. While Holguin’s beaches are truly spectacular, the province offer much more in terms of eco-tourism – tall, dramatic mountains, fertile valleys, and three National Parks, one of which, the Parque Nacional Monumento Bariay, was built in 1992 on the site of Christopher Columbus’ landing to commemorate the 500th anniversary of the event. Due to the 50-year embargo, most Americans might not have heard of many Cuban cities except Havana, Santiago de Cuba, and, perhaps, Varadero, but Cuba is a paradise for a discerning traveler due to its cultural heritage and unspoiled nature preserves. And considering the low price of admission, today might be a great time to explore the island beyond the beaches, before everyone and their mother has booked a flight. In our opinion, the no annual fee JetBlue card is not worth considering. It only has a 5,000-point bonus and very few benefits. However, the Plus and the Business cards offer an excellent suite of benefits including the 30,000-point bonus after meeting an easy $1,000 spending requirement. The card gives you six points per dollar for JetBlue purchases and two points for restaurants and grocery stores (office supply stores for the business card). In addition, you get other valuable benefits, like free checked bags and a 10% refund on redeemed points. If you enjoy flying JetBlue, you might want to consider at least one of these cards. Read our review of JetBlue credit cards for more details. JetBlue is an American Express Membership Rewards transfer partner, and 250 Amex MR points will get you 200 JetBlue TrueBlue points. 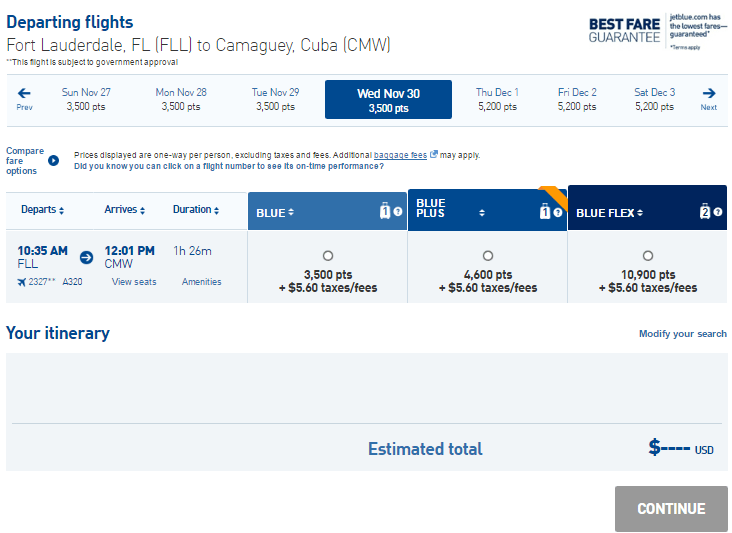 While it might seem like AMEX points would be slightly undervalued in this transaction, consider that the flight to Cuba would only take 4,375 AMEX MR points one way. That would yield 2.1 cents for each Amex MR point (remember the $93.40 airfare), which is an excellent value. In the past, American Express has come up with special offers for transferring points to airline programs including JetBlue. Last November it offered a 30 percent bonus for transferring points to JetBlue, so 260 TrueBlue points would’ve only cost 250 Amex MR points. If you are on the fence about transferring your points now, it could be worth looking out for a similar offer.